Successfully Added 14 Inch Portable DVD Player - 270 Degree Swivel Rotation, 16:9 Aspect, 1024x768 Resolutions, HDMI Out, Game + Copy Functions to your Shopping Cart. 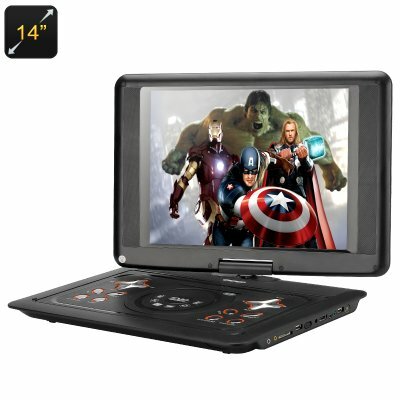 14 Inch 1024x768 Portable DVD Player with 16:9 aspect ratio HITACHI lens and a 270 Degree Swivel Rotation screen makes gaming and movies fun on the go. If you’re looking for that large screen resolutions and beautiful colors but in a portable package then this 14 inch portable DVD player is choice for you. With 1024x768 resolution you will get a clearly superior picture with good depth and vivid colors that are sure to impress. Its light weight enough to take away with you on holidays or camping trips or equally well suited to those late night shifts or long road trips. Supporting all common disc formats including for AVI, EVD, DVD, SVCD, VCD, CD and CD-R/RW discs you're spoilt for choice with what to play and the addition of an SD card port as well as memory pen support and TV antenna makes the visual and audio possibilities truly expansive. If you want more interactive entertained then the hand held game controller lets you enjoy all manner of classic 32bit games that you can download from a computer to play through the USB drive or on a CD or DVD. With the screen able to rotate a full 270 degrees you can set up the best viewing angle no matter where you may be. The built in stereo speakers will deliver great audio and the 14 inch screen has a 16:9 aspect ratio so blockbuster movies and widescreen shows will not appear cropped or distorted. With an in car charger you can keep the device running for hours on end to deliver a high level of entertainment. With an HDMI out port you can even connect it up to most modern TV’s so you can watch DVD’s in your hotel.